LIGHTEN YOUR LOAD THIS WINTER! You only need a few seconds. Specially designed by passionate skiers, it only takes seconds to place your skis in the carrier and be on your way! All you have to do is attach two straps to your skis and go! SKISS is a simple, practical, and elegant solution. The ski carrier is specially designed to offer you a comfortable way to carry your skis that is simply unprecedented. 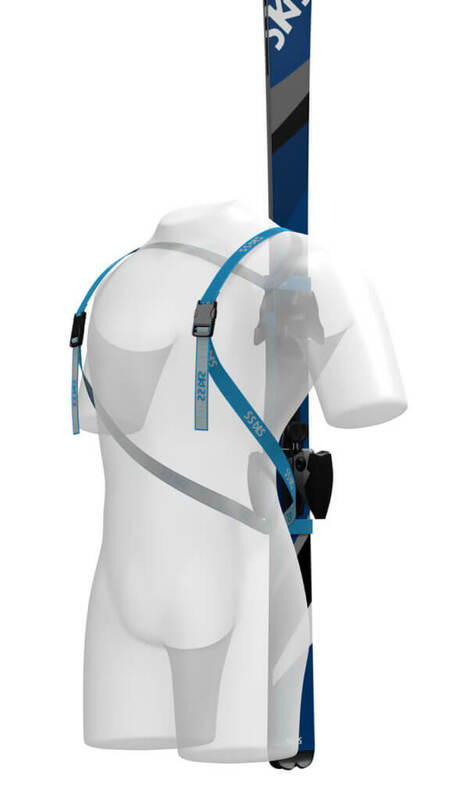 It fits right on your back and lets you effortlessly and naturally carry your skis anywhere! After just a few seasons, the SKISS ski carrier has become practically indispensable for comfortable and relaxing ski trips. SKISS, THE BACKPACK SKI CARRIER TO LIGHTEN UP YOUR VACATION!